The existing storage protocols fail to meet growing all-flash datacenters demands. This results into performance bottlenecks and latency increase. The high-end protocols NVMe-over-fabrics (NVMf), iSER or SMB Direct are designed to easily tackle this problem. They use RDMA, which helps to achieve performance breakthrough and decrease latency. 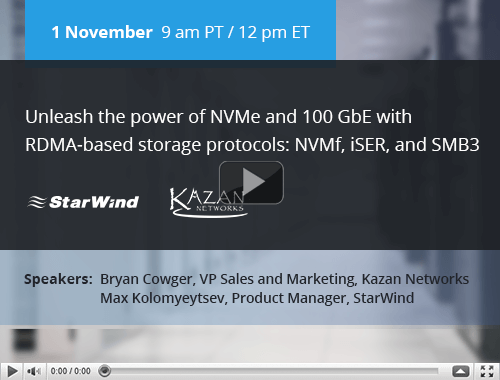 Watch the webinar to learn how to implement NVMf, iSER and SMB Direct protocols with StarWind in order to enjoy NVMe advantages to the fullest.